You’ve picked the right country! Peru is safe, developed, and boasts of every type of terrain possible. 2 weeks in this South American country is ample time to soak up the Peruvian culture without feeling rushed. Here is our extensive Peru itinerary, which can be reduced or extended depending on your timescale. It details the top Peru tourist attractions, how to get around, what to eat and drink, where to stay and how to make your budget stretch. Although I have recommended a number of days for each location, you can pick and choose which stops meet your touring Peru needs best. Most travellers fly into the capital, Lima. If you have one night, stay in Miraflores, it’s very touristy but has everything on your doorstep – food markets (North America’s embassies – McDonalds etc), clothes shops, bars (Tenerife strip style), and an amazing view of the beach. The Larcomar is a complex of more upmarket shops and restaurants as well as a cinema and bowling alley. The sunset is not to be missed from this spot. If you have more than one night in Lima, stay in the trendy area of Barranco. Cute coloured buildings, art, and microbreweries! A nice balance of attractions for your Peru itinerary. 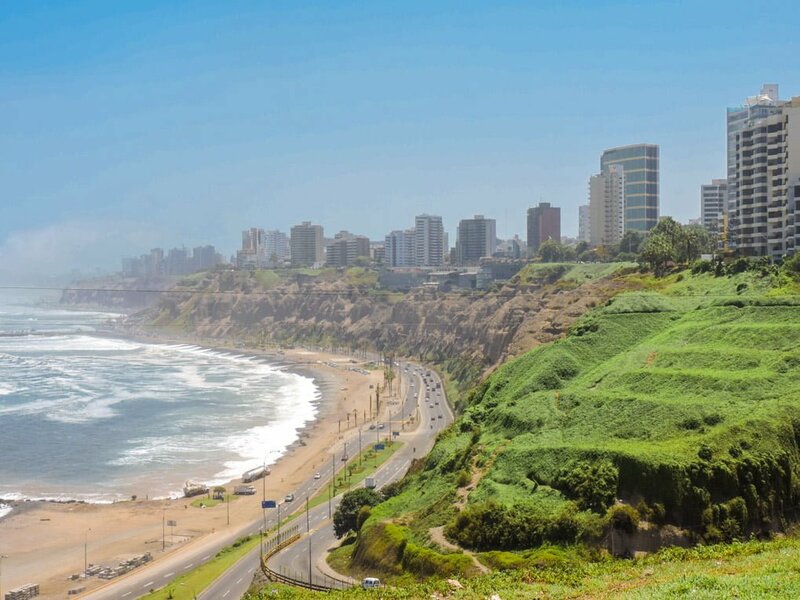 Hotels in Miraflores are surprisingly cheap. Apart Hotel Petit Palace Suites is popular with holidaymakers who like the clean comfortable rooms, fruit and bread continental breakfast and professional staff. Free bikes are available, take a ride along the Malecón! Standard rooms start at approximately £50/$71, prices go up to suites at £100/$143 (5 people). Click to check availability. The Luxury Inkari Hotel is spectacular! The heated swimming pool and gym with sauna get a thumbs up from visitors who also enjoy the restaurant and cocktails. An airport shuttle is available. Click to check availability. For a rooftop pool in Lima check out the 5-star Hilton Lima Miraflores. The super modern rooms are kitted out in luxury linen. Deluxe rooms start at around £150/$215 with the Executive for four people capping at around £320/$459. Click to check availability. Hostels in Lima are your cheapest option and they are pretty economical starting at just over £5/$7 per night for a dorm bed. Most offer a (dry) bread and jam breakfast and social events on rooftops etc – click here to check reviews and best prices for Lima hostels. Private rooms average at around £25/$35, which is pretty typical for hostels in Peru. I would honestly love to stay in the Barranco area of Lima and there are a few welcoming options for backpackers such as Barranco’s Backpacker’s Inn. 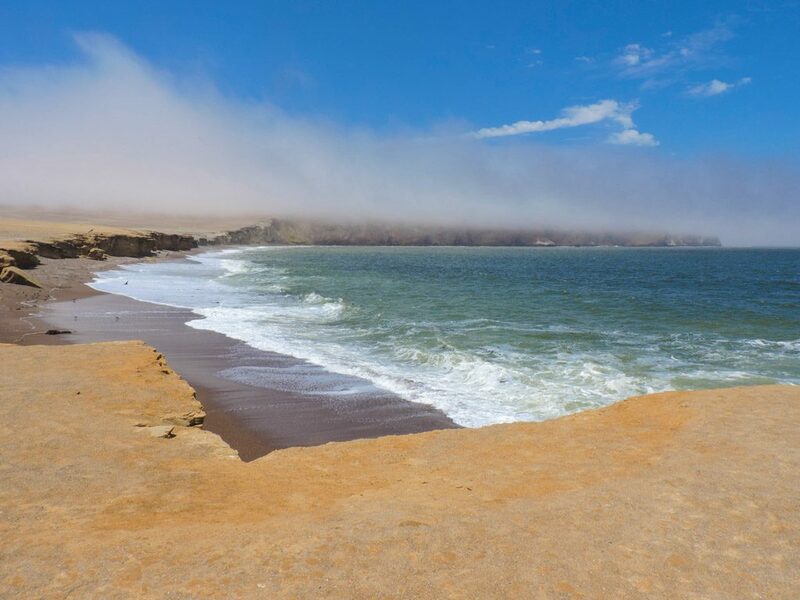 Paracas is a small beach town approximately four hours from Lima. 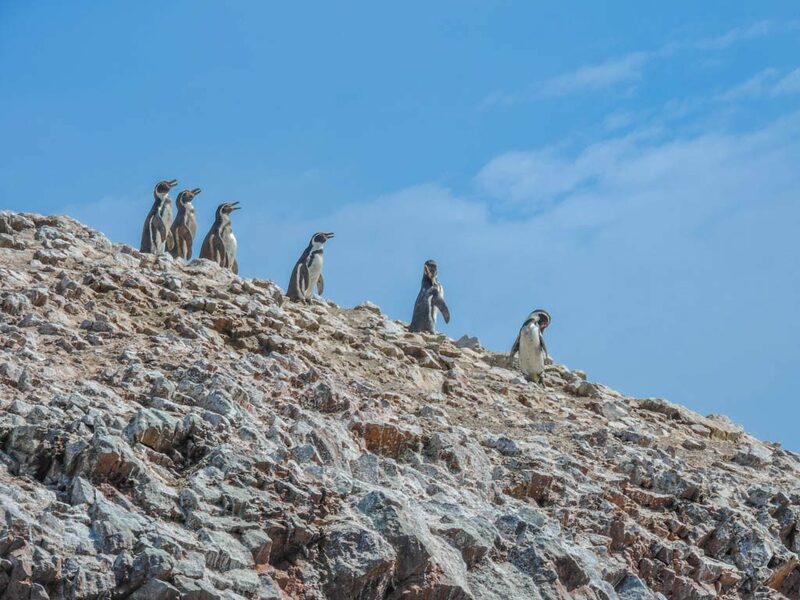 It is the gateway to Isla Ballestas, ‘the poor man’s Galapagos Island.’ By speedboat (not fancy a cabin boat, take layers to wrap up), you can see Humboldt penguins, seals, sea lions, and birds. Isla Ballestas has its very own Nazca Lines called Candelabra Geoglyph, 150m high and 50m wide. La Roche-Posay factor 60 cream when splurging. Never sacrifice a smooth face for the sun! Check out boat tour availability by clicking here. Hotel Hilton Paracas is the most popular option. This modern hotel is located next to the Paracas National Park. Many of the rooms have balconies with either a swimming pool or sea view. There’s a restaurant and breakfast for an extra fee. The Inca Spa offers massages so if you are after a relaxing break, there’s really no reason to leave the DoubleTree by Hilton Resort. Room prices start at £127-280. This is luxury in Paracas. A cheaper option is the new Hotel Riviera Inka Paracas. One of the nicest features is the balcony as well as the proximity to the beach and El Chaco Boardwalk. Breakfast is included and rooms start at £40/$57. Paracas is a small town so there is not much choice when it comes to accommodation with under 10 hostels available in the area. However, sometimes size does not matter, Paracas ticks the box for variety – party backpackers tend to flock to the well-known chain Kokopelli Backpackers which has a pool and is directly on the beach (we walked right through it to get to the playa). We stayed in their capsule style dorms in Cusco and found it private but still sociable, great concept. Breakfast is also included. For rates under £8/$11+ and reviews see here. For a more chilled stay check out the new 11 rooms with private bathrooms and 12 share of the Paracas Backpackers House. Facilities include a kitchen, three common areas, one with hammocks. Prices, reviews and availability can be found here. The most interesting looking to me (which wasn’t there when we visited) is the Paracas 360 Eco Hostel, check out the bedrooms; they are like mini-caravans (there’s a bar and swimming pool too). No breakfast provided. To see if there are rooms available and at what cost, click here. Budget backpackers, there are dorms available for under £5/$7. See reviews for the full range of hostels in Paracas – read the overview. Man-made or aliens?! 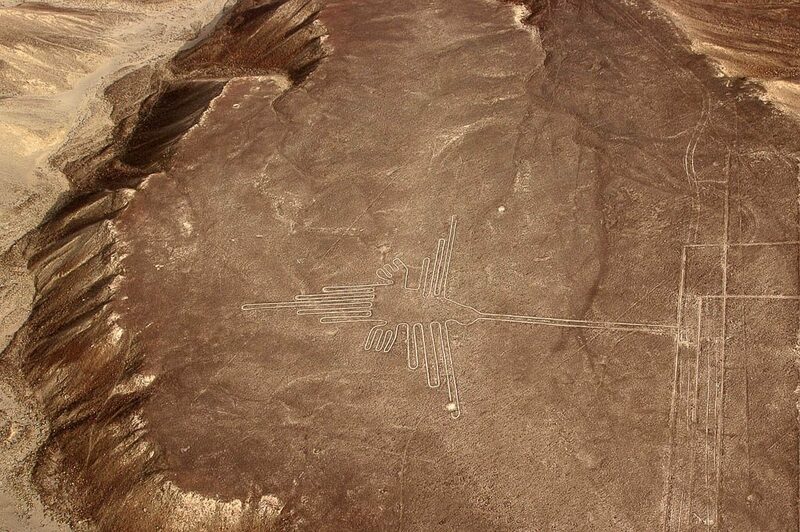 The burning question that lies with Peru’s Nazca Lines. Budget travellers can see the Lines from the viewing platform for a couple of Peruvian soles. For those who truly believe, there are companies which offer helicopter rides over the twelve Nazca Lines. Check availability before you head to Peru – these helicopter guides are English speaking and the ride is 45 minutes for just under £300/$430. If you do decide to take the flight you’ll need somewhere to stay and there are a few options with 9/10 reviews from fellow travellers so you are in safe hands. The small Nanasqa Hostel is close to a supermarket, offers a pick up from the bus station if the car is available and probably most importantly boasts of a selection of local beers. Dorm rooms are economical, check out their rates and availability. Four-bed dorms and private rooms are also available at the Nasca Lodge. This colourful hostel also offers a car pick up from the bus station and towels (do you travel with a towel? I hate the feeling of those travel ones, we ended up just hiring or booking accommodation with them). Prices depend on the type of room, see here for more details. Check out the full range of hostels in Nazca to see which fits your budget – see the overview here. Nazca Lines – do you believe? Ever partied in an oasis? Huacachina is one of the best places to visit in Peru! A small (party?) town surrounded by large sand dunes, itching for you to board (or ski!) down. There are a plethora of companies looking to take you to the dunes but for the authentic experience choose one which offers appropriate gear (authentic boards and boots) and the opportunity to ski. Mode of transport? Buggies! Huacachina is a fun place to spend a weekend if you want to relax by the pool (Banana’s Adventures Hostel) or have some drinks. An unusual hotel in Huacachina is Desert Nights Ecocamp. The glampsite is set up on the dunes looking down on the oasis. There’s definitely no sleeping on the floor – tents have double beds. A swimming pool is also available as well as a bar and cafe/restaurant. A more basic option is the Hotel El Huacachinero which has private bathrooms, a shared common area, swimming pool. This hotel is only a three-minute walk to the restaurants and bars. I honestly have such fond memories of our stay at Banana’s Adventure, we ended up staying for three nights instead of one. Like all hostels in Peru, Bananas has dorms and privates, we had no issues sleeping regardless of the rooms being around the pool area, the bar closes and everyone heads around to Huacaf*ckingchinas, including the bar staff. 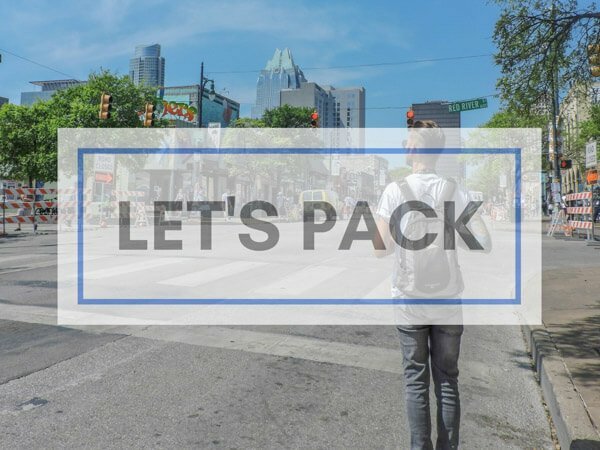 Check out the best option for your trip here. The rest of our Peru Hop companions stayed at the hostel with the Friday/Saturday nightclub attached, Casa De Arena. Personally, I avoid hostels which are the party place, I like to visit them, drink and dance and then get some rest elsewhere, the decision is yours. Check out more review here. 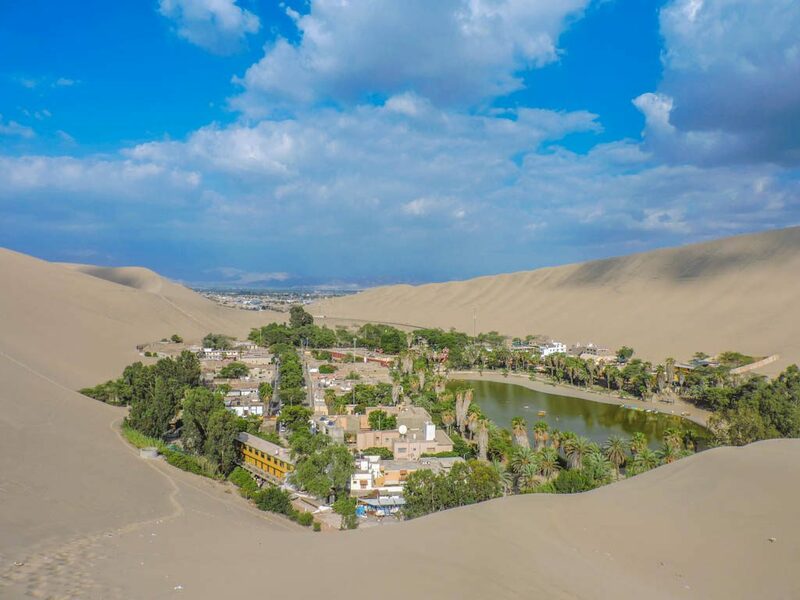 Huacachina hostels have seen a bit of competition over the last few years and there is certainly more choice, check out the other options at the Huacachina overview. Arequipa (Are-eh-keepah), The White City and gateway to the Colca Canyon is a city like no other. Peru’s second most populated city is surrounded by three dormant volcanoes, El Misti, Chachani, and Pichu Pichu. The ‘free’ walking tour, run by students (pay by tip, which is typical in South American cities) is extensive and recommended. Grab a jugo (juice) from San Camilo Market (The Witches Market) then get a good night’s sleep for your early rise to the Colca Canyon. Can you believe we saw this at the Witches Market in Arequipa? There are over 150 hotels in Arequipa ranging from £20/$29-£160/$229. La Hosteria is an elegant hotel located in a renovated Colonial house only 5 mins from the historic centre. Continental breakfast is offered daily and rooms have TVs. Click here to check availability. Katari Hotel is located in the prime spot of Plaza de Armas and the panoramic views from its rooftop are incredible. Rooms are elegant and breakfast is included in the price which starts at £77/$110. Click here to check availability. We stayed at the chain hostel, the Flying Dog. It’s peaceful, breakfast is included and you can book your Colca Canyon Tour guide through them. It is on the quiet side so if you are looking for a party hostel I’d veer towards Wild Rover which has a bar and swimming pool. Breakfast is also included. 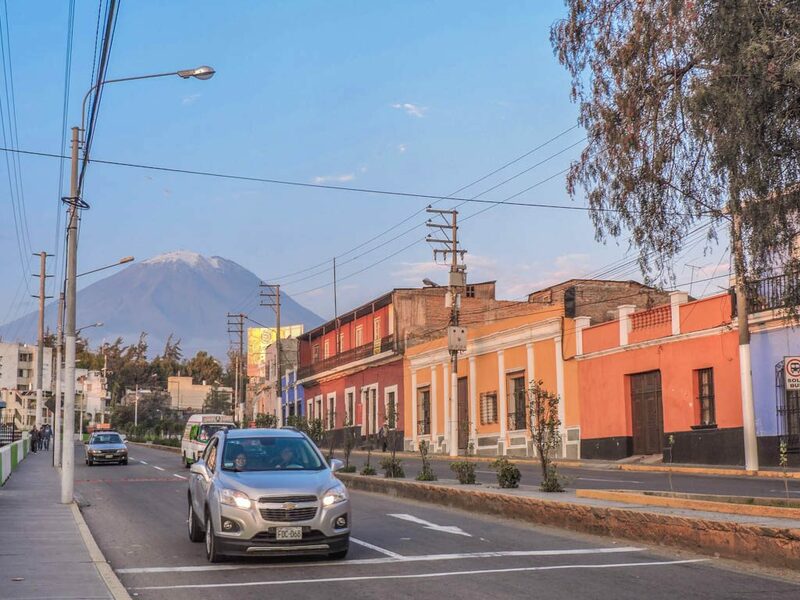 Arequipa is a big city, there are over 50 hostels to choose from so do check out which suits your needs and cash flow in this guide. 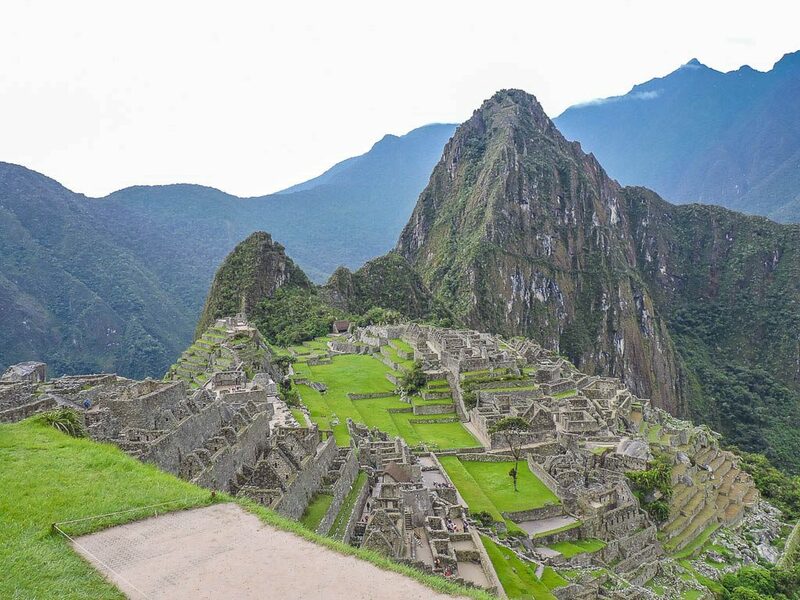 You are researching a trip to Peru so it is highly likely that you have either secured your place on the Inca Trail to Machu Picchu or you are deciding between one of the alternative treks to the seventh modern wonder of the world. Stop right there! Consider this – two or three day hike down into the world’s second deepest canyon (3,400m), a sound sleep in the canyon, and then a steep climb out! The Colca Canyon trek is often overlooked and shouldn’t be. Watch condors swoop overheard, sip soup in a local’s home, and feel self-satisfaction as you make it to the top! Hiking is great for keeping fit while travelling, add to your Peru trip itinerary to combat the backpacker’s belly. Another overnighter to the cobbled streets of Cusco. Many travellers get sucked in by Cusco’s beauty and simplicity. Everyone that is backpacking Peru ends up in Cusco at some point (the start of their Peru itinerary if coming from Bolivia or near the end if they are starting in Peru). It did rain every day for one week in Cusco! Marmot PreCip as it is light and folds into its own pocket, small enough to pop into my bag after the downpour. This is where you will begin the trek to Machu Picchu (Inca, Salkatanky, Lares or Jungle Trek – anywhere from £199-£332+/$285-$475+). It is vital that you spend some time acclimatising before you begin your trek or you run the risk of suffering from altitude sickness. 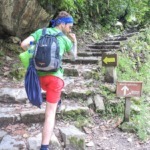 It is also advised that you select a travel insurer which allows you to climb to the heights stipulated in your trek guidelines (for example, the Lares Trek reaches highs of 4650m15255ft above sea level). We shopped with True Traveller because of their coverage of these high altitudes, mass importante! See if their rates work for you by clicking here. Hiking, not your thing? The train to Machu Picchu leaves and returns to Cusco. Do stop in the archaeological site town of Ollantaytambo, if you have time! Machu Picchu is not the only day trip. It is easy to spend a fortnight in Cusco if you are looking to attend Spanish school (and a homestay to practice what you are taught). For space geeks, Cusco has its own family-run planetarium! 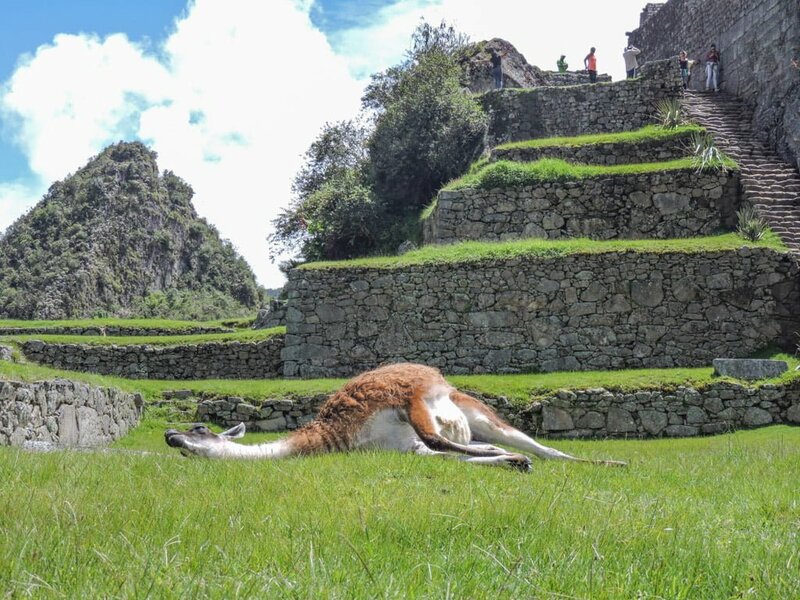 Check out how we spent two weeks in Cusco…. Cusco has some of the loveliest hotels in Peru and prices start from around £23/$33-£450/$645. Why not stay in a former monastery which dates back to 1592? Belmond Hotel Monasterio is a luxury hotel in Cusco, close to the action but set in serene gardens. Rooms are fully equipped and there are dining options on-site. Prices start at £294/$421. Click here to check availability. We played Goldilocks in Cusco over the two weeks we spent in Peru’s cutest city. We tested the beds of three different hostels and dined and partied in a few more. Initially, we stayed with Kokopelli Hostels, their private capsule style dorms are really neat, you just pull a curtain over for privacy. The hostel has a bar which serves food and puts on social events. Free tea is available and coca leaves are in abundance. We left our luggage with these guys when we hiked to Machu Picchu. Check the variety of rooms and rates here. After Machu Picchu, we tried the ‘other side’ of Cusco, San Blas. This is the more bohemian side of the city. Our first hostel was Casa de la Grinda which is an option for those in Peru to try some of its more ‘natural remedies’ (we didn’t). We ended our time in Cusco at Thomas Grill and Garden, the views from the top room are incredible. The hostel also has a kitchen. It’s very quiet so not for those looking for a disco. We partied at Loki Hostel which is another popular choice for backpackers throughout Peru. There are over 100 hostels in Cusco! Check out more here. A small town which is very much a ‘normal town’ in Peru but has a port where boats take travellers to the Floating Islands of Uros. 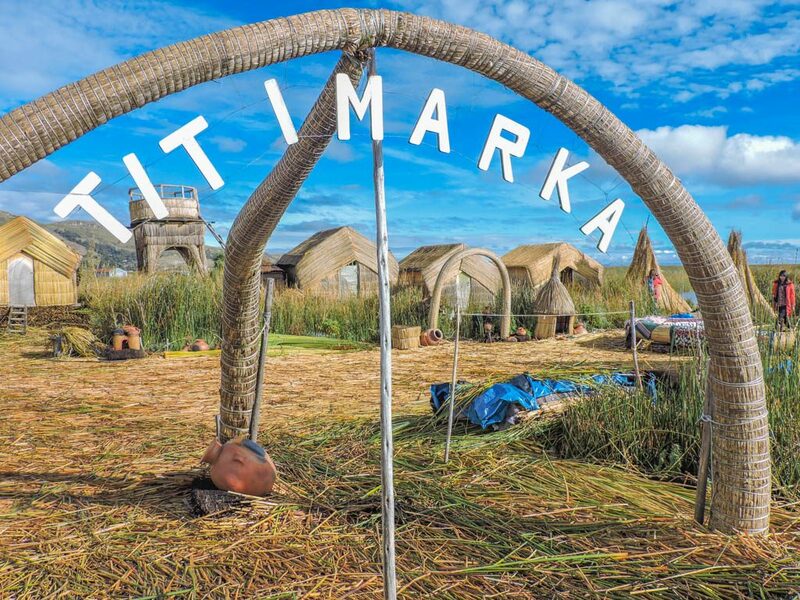 These are reed (also know ask totora) islands inhabited by the Uros people on Lake Titicaca. The half-day trip from Puno is a wonder to behold but may be looked upon as ‘touristy’. There are no cars on Taquile Island, life is simple and traditional. Ask about the environmentally friendly, Chukjo! This tour can only be booked through Inka Rest hostel, we stayed there for two nights in a private room, breakfast was extensive and the staff were friendly (a tad mad!) This Peru trip would really only be feasible for those spending 3 weeks in Peru. For a less authentic but still different experience try a homestay on Amantaní Island. Both islands can be reached by boat, however, this must be booked through an organised tour (approximately 85 soles/£ 18/$27 each). Over half of Peru is a jungle! This country really has it all. 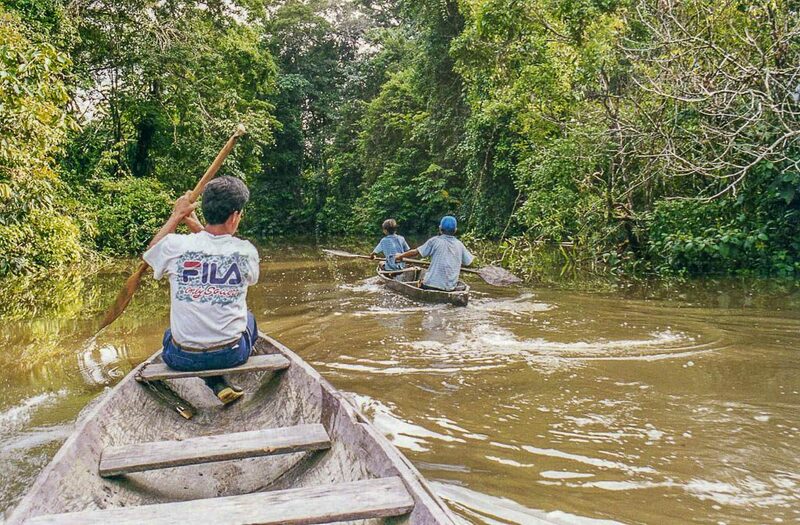 Peru shares The Amazon with Colombia, Ecuador, and Brazil. There are many indigenous tribes still living in the Peruvian rainforest and a variety of animals call this region home too. The city of Cusco is the best entry point for travellers looking to spend time in the jungle and there are many companies who sell trips. Please do some research on the ethics of companies, there are stories of mistreatment of animals by some. If there is a guide holding a snake in an advertisement photo, give that trip a wide berth! There are lots of options depending on budget and wants. Puerto Maldonado is accessed by air and road which is the base for Madre de Dios (Reserva Nacional Tambopata and the Parque Nacional Bahuaja-Sonene) and deemed the best place to go to visit wildlife by Rough Guide. Cheaper options may include taking a bus from Cusco via Ollantaytambo to Quillabamba where lots of travellers go to do white water rafting on the Río Urubamba. There are options from Lima too. According to Go2Peru, Iquitos is the world’s largest city that cannot be reached by road! Iquitos can be reached by plane, LAN, Peruvian Airlines, and Star Peru fly daily. There are one-day or multi-day trips to the Amazon to suit every budget and can be booked before your reach Iquitos for whilst you are there. Naturally, there are lots of scams so choose your company wisely. It is cheaper to go to the rainforest via Bolivia, this is what we intended to do so skipped it in Peru. You will 100% need some form of mosquito repellent. Avon So Soft after nothing was working for us and we had the fear about putting DEET on our skin after a year of applying it on and off. Huaraz is a small town known as the hotbed for Peruvian hikes. This high altitude town (3000m absl) is a base for many backpackers who are planning 1 day and multi-day treks around Peru’s Andes Mountain Range. The best time to visit is typically June when there is little rainfall or snow. 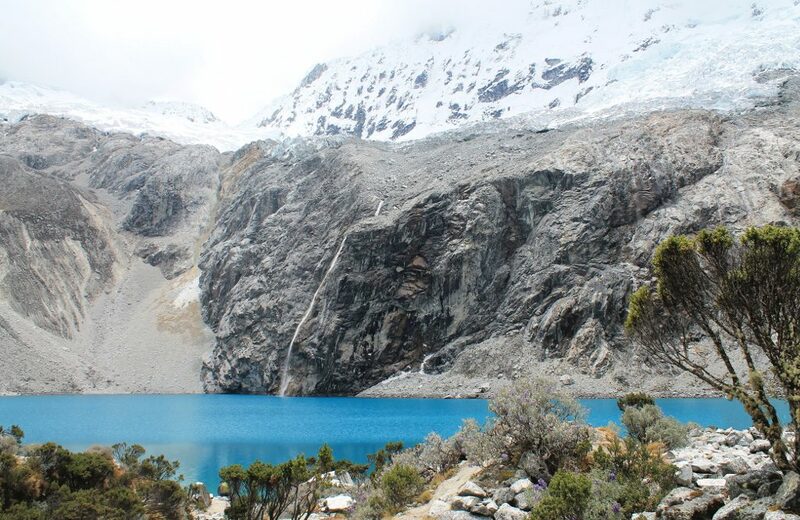 Popular hikes include the 1-day trek to Laguna 69/ Lake 69 (that Canadian blue! ), 1 day Paron Lake, 3-4 day Santa Cruz hike (best views of the peaks of the Cordillera Blanca) or the 12 day Cordillera Huayhuash circuit. It is advised that you do two 1 day hikes (or more) to help acclimatise before attempting the multi-day Peru treks. Highs can reach 5000m absl. I really wish we had added this to our Peru backpacking itinerary. Trekking Peru at high altitude can get uncomfortable, make sure you acclimatise well. *If Huaraz is on your Peru itinerary, I would suggest visiting after Lima as it is north of the capital. I am very disappointed that we missed this out. But do check out Jon is Traveling’s experience of his trek to Laguna 60. There are quite a few options for hostels in Huaraz. You definitely want to get a good night’s sleep before the hike so be sure to check the reviews before you book. La Casa de Zarela is a fair trade hostel only 10 mins walk from the bus station. There are a variety of rooms and kitchen facilities. For reviews, prices and availability click here. North of Lima you’ll find the Piura Region and a coast of beaches where travellers go to party. 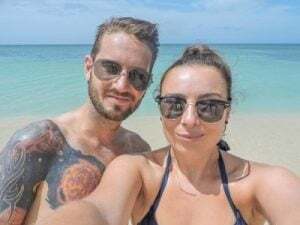 Not a bucket list option for many travellers who have previously spent a month on the Colombian coast but an option for those looking to chill out (in what some critics say, not the cleanest of beaches), surf (South Beach), or dive (Vichayito Beach). *If Màncora is on your itinerary, I would suggest you visit there before moving further south. 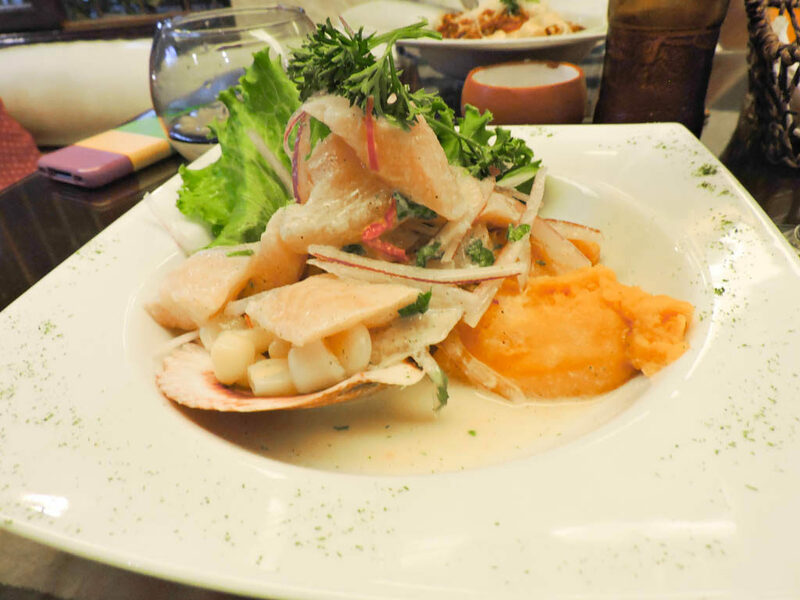 I’m not disappointed we missed this, we never actually met anyone who had Màncora on their Peruvian itinerary. There is a mix of chill and party in Màncora hostel wise. Loki makes another appearance (you’ll see the popular party hostels at most stops in Peru) with Loki del Mar, not only is it close the surf breaking point but it also has its own swimming pool. More laid back options include ocean view bungalows at Misfit Hostel. Vegetarians may want to swing by Marcilia Beach Bungalows (accommodation available as well as a cafe). There’s more! Check out reviews, rates and availability. 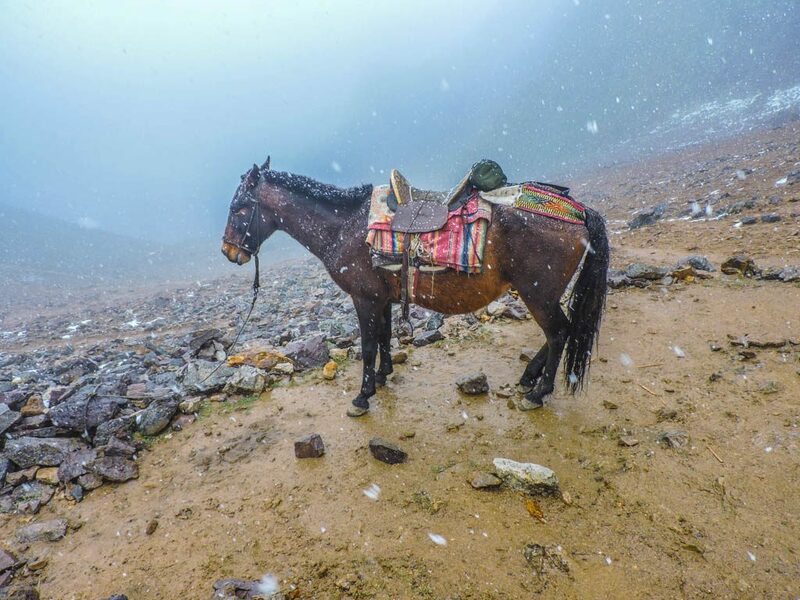 Peru’s weather is best measured by the ‘dry’ and ‘wet’ season as opposed to summer and winter. 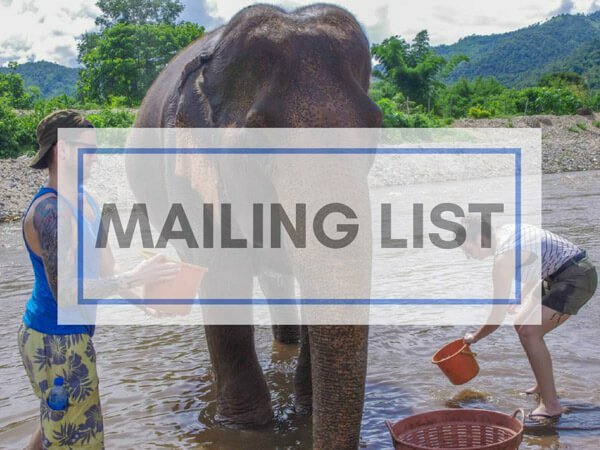 May – October is essentially the dry season which results in more tourists. However, nights can still be cold, especially for those who are in Peru to trek. November through to April fall into the ‘wet’ season. This is subject to change as Peru is seeing the effects of the weather phenomenon, El Niño. Peruvians use the Peruvian Nuevo Sol or soles. ATMs in Cusco have a maximum withdrawal which can be problematic when settling bills for treks to Machu Picchu. Expect a 5.5% charge when using Visa. Bargaining in markets is acceptable but not always successful! Most of the larger city airports have flights to Lima. UK and U.S citizens do not require a visa to enter Peru and should be granted six months on their ‘little white sheet’ at immigration. This is not always the case when you arrive at immigration. Keep the immigration information (‘little white sheet’) with your passport as you need it to leave the country. Cruz del Sur is popular but is simply a bus company, no tours or information offered. 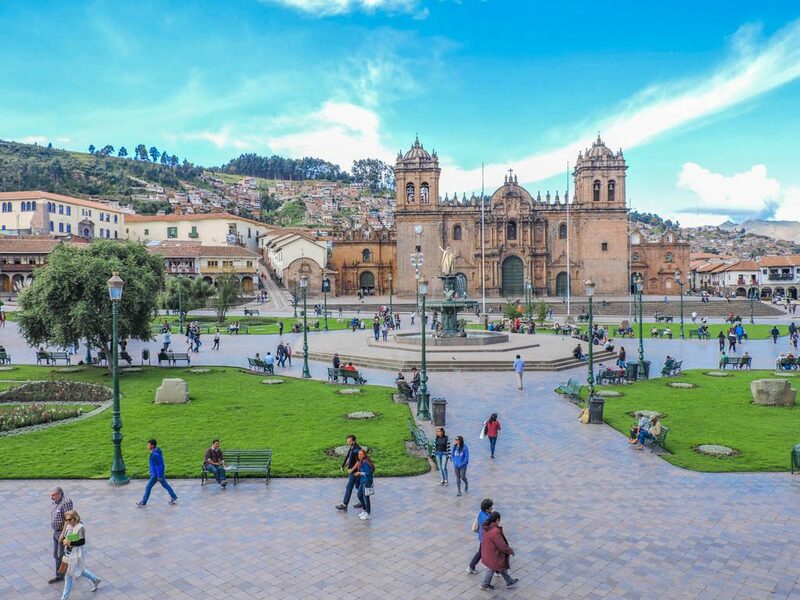 Internal flights will connect Lima with Arequipa and Cusco but again, remember to give yourself time to acclimatise when arriving in Cusco. 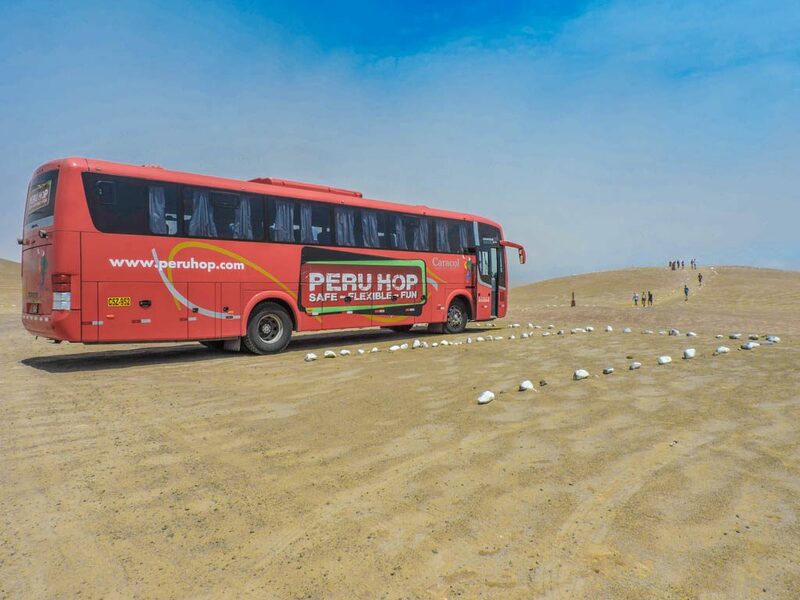 There is an efficient and safe hop on/off bus service called Peru Hop. 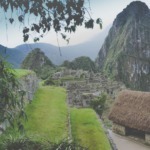 Click these links to discover the easiest way to travel: Peru Hop / Bolivia Hop. For those on a budget in Peru, hostels are your best sleeping option. Prices vary depending on where you are. For examples in Lima, a dorm bed may cost £5.50 to £12 whereas in Huacachina you will find one for £5/6. Homestays are popular in Cusco for those looking to work on their Spanish (although cheaper in Sucre, Bolivia if heading that way). For those on a more modest Peru vacation, with the exception of the homestay islands, you will find hotels from basic to boutique or uber luxury with spas. Chifa is Chinese food with a Peruvian fusion, or just Chinese food really! Dulce de leche, the Peruvian Nutella! It’s toffee not chocolate, rico (tasty)! You’ll get all your normal fruits in Peru, they are just bigger and tastier! New additions include Granadilla which gives you the sensation you are sucking frog spawn but it is delicious and refreshing. Corn is very popular, you’ll find lots of vendors selling popcorn. Before I get onto the hard stuff let’s talk about drinking water. It is not advisable to drink tap water in Peru. We travelled with a purifying and filtering water bottle and managed to avoid Dehli belly for the full month so I suggest you do it! 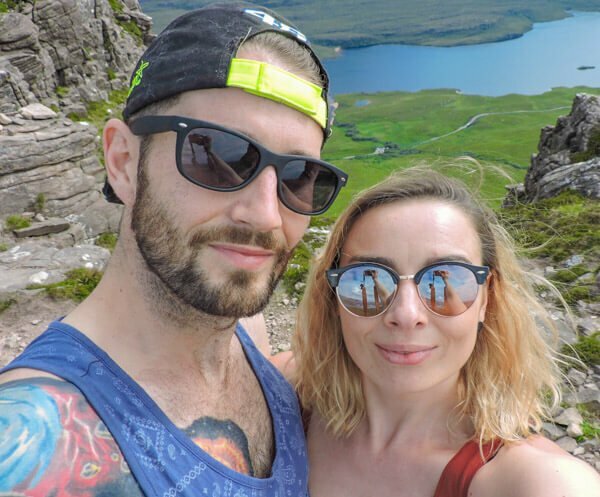 Please take our point about travel insurance seriously! We met a guy who was sick and when his friend finally dragged him out of the dorm bed to see the doctor it turned out he had dehydration. Look after yourself and get travel insurance, here is the link to the company we use. 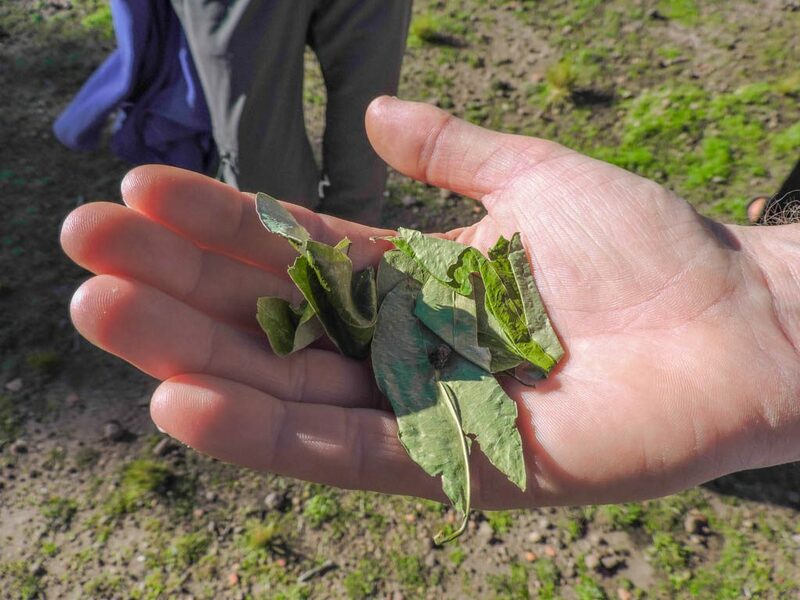 Coca Leaves – Altitude relief? It’s easy to see how 2 weeks in Peru can be extended or merged into a quick trip by picking what you feel would be the highlights from above. I hope that you find this Peru 2-4 week itinerary useful, let me know in the comments below! Over to you – any other suggestions/questions? What do you think of our other posts on Peru? I would be well up for that! I could see us going back purely for a hiking holiday. Have you made it to Colombia yet? One of my favourite countries for landscape, history and friendly locals. 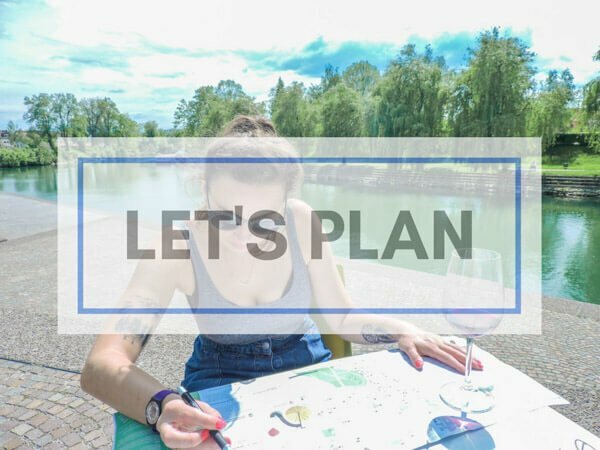 Here’s our guide if you are looking for some inspiration! I really loved Colombia, would go back in a heartbeat. Thanks! Thanks. Heading there in October. Gracias John and Susan! It’s a great country due to its variety of landscape. Have an avocado for me! This is a fantastic and ever so helpful post!! 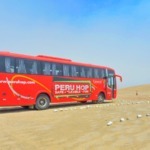 I was just wondering, in what currency are those prices for the PeruHop bus? I went to there website but I cannot tell on there either. Thank you! Good question – American dollars. Did you catch our honest review? You can read it here. I have enjoyed reading your blog. My husband and I are heading to Peru next weekend for 3 weeks. We are touring the southern part from Lima through to Cusco up to Machu Pichu. Going to use Peru Hop as a means to seeing most of what I have researched. I am concerned about hopping off a bus and spending more time somewhere and then hopping back on a bus to continue on. Any thoughts on that? We did that! We took longer breaks in Huacachina and Arequipa (to hike the Colca Canyon), it’s totally normal. You are going to have a great time, Peru is an amazing country! Come back and let me know how you get on please. Absolutely fell in love with Peru, such an amazing country. Totally agree! There really is something for everyone eh?